Almond paste is made from ground almonds and sugar, typically 50-55%, with a small amount of cooking oil, beaten eggs, heavy cream or corn syrup added to bind the two ingredients. It is similar to marzipan but marzipan contains more sugar than almond paste, and often contains additional ingredients such as food preserves and food colouring. Blanch almonds and let them dry and grind them in any way you like but they must be really thin. (I grind them in a spice grinder together with some sugar). Whip the eggs until frothy but you don’t have to make them into meringue. 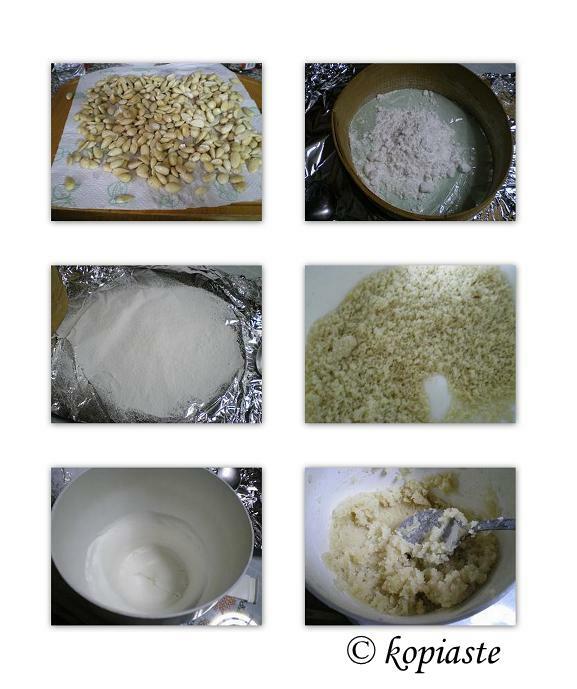 Sieve the icing sugar and add the almonds as well as all the other ingredients and mix until a thick paste is formed. Instead of blossom water you may add rose water or vanilla. After adding sugar try it and adjust sweaetness, if necessary. I use the almond paste for making the first layer for the Christmas frosting. Before adding the almond paste, spread the jam and then the paste all over the cake with a knife and let it dry for two – three days and when it dries, spread the Royal Frosting on top. You must be saying something wrong because I understand tilikta but “megtalta” is not a word I know.